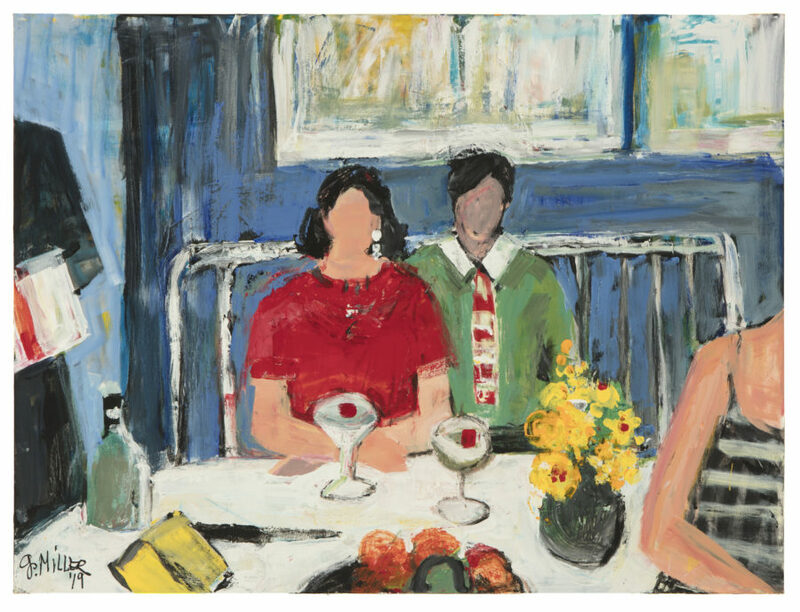 In Dinner with Mom, Lawrence-based artist Gerry Miller represents a man and woman seated at a table directly across from the viewer. She places the couple at the center of the canvas and renders them as rhyming forms: sloping shoulders, blocky bodies, and oval-shaped faces without features. Miller describes the feminine figure with broad strokes of cherry red, black, and nectarine pink; directly behind her the artist paints the masculine figure with a cloudier version of the same palette, but with a complementary shade of green to contrast the feminine figure’s red. Given the title, perhaps the couple poses for a photograph taken by one party’s mother, or they may be engaged with her in conversation. In front of the couple, Miller uses confident daubs of unmodulated paint to present accouterments of an evening meal at a restaurant: a carafe of water, cocktails with bright red garnishes, a bouquet of cheerful yellow flowers, and a knife and cheese. Partial figures on either side of the image evoke the flurry of activity in a dining room. On the left, black angular shapes and bands of white and red suggest a waiter’s suit with a towel over his arm. In the right foreground, a peachy form wearing black and white stripes brushes past, perhaps a diner from another table. Miller’s bold palette, stylized figures, and her use of geometrical shapes to represent organic forms recall the early work of her mentor Albert Bloch, the only American artist associated with Germany’s Blaue Reiter (Blue Rider) movement (1911-1914). Bloch contributed significantly to the arts in Lawrence as head of the Department of Drawing and Painting at the University of Kansas from 1923 to 1947. Miller continues Bloch’s artistic legacy in Lawrence as a prolific painter and a regular participant in the annual Benefit Art Auction.